Nearly 18,000 women at 20 health care facilities were screened for cervical cancer between October 2009 and September 2014 through a Jhpiego-supported program focused on reducing maternal deaths in Côte d’Ivoire. Abidjan, Côte d’Ivoire—A dozen women are gathered in a spacious, first-floor room at Marcory Hospital one Tuesday, listening to a doctor and midwife explain the risks of cervical cancer and the screening services available at this city health facility. Seated among them is Irene, an HIV-positive mother who has returned to Marcory for her annual cervical cancer screening. The 37-year-old woman is here because she recognizes that, because of her HIV status, she is at greater risk of cervical cancer, a leading killer of women in the developing world. In response to this increased risk, the Ministry of Health in Côte d’Ivoire recommends annual cervical cancer screening for HIV-positive women. As Dr. Martin Kouassi and midwife Raymonde Gnenaty address the group in Marcory, they emphasize that HIV-positive women need to take charge of their health and return annually for this screening. “Cervical cancer is an illness like others that can be avoided as long as women go to a health center to be screened and treated if there is a precancerous lesion,” says Dr. Martin, who goes by his first name. The two health care providers are among the 124 doctors, midwives and nurses at 20 health centers and hospitals who have been trained in Jhpiego’s single visit approach to screen for and prevent cervical cancer. Women are screened using acetic acid—the main component in vinegar—and if precancerous lesions are discovered, they are treated during the same visit with cryotherapy to avoid future disease occurrence. Under the University Technical Assistance Project (UTAP II), Jhpiego began providing technical assistance to the Ministry of Health in 2009 to help reduce morbidity and mortality linked to HIV/AIDS. The U.S. Centers for Disease Control and Prevention, which funds UTAP II, supports this innovative screen-and-treat initiative through the U.S. President’s Emergency Plan for AIDS Relief. UTAP II seeks to ensure that HIV-positive women receive timely and high-quality screening services to prevent cervical cancer. Between October 2009 and September 2014, the 20 health care facilities participating in the project screened a total of 17,988 women. Of these, 11,351 were HIV-positive. Nine percent of the HIV-positive women were found to have precancerous lesions. Eighty-seven percent of the women who were eligible for treatment received cryotherapy on the same day. 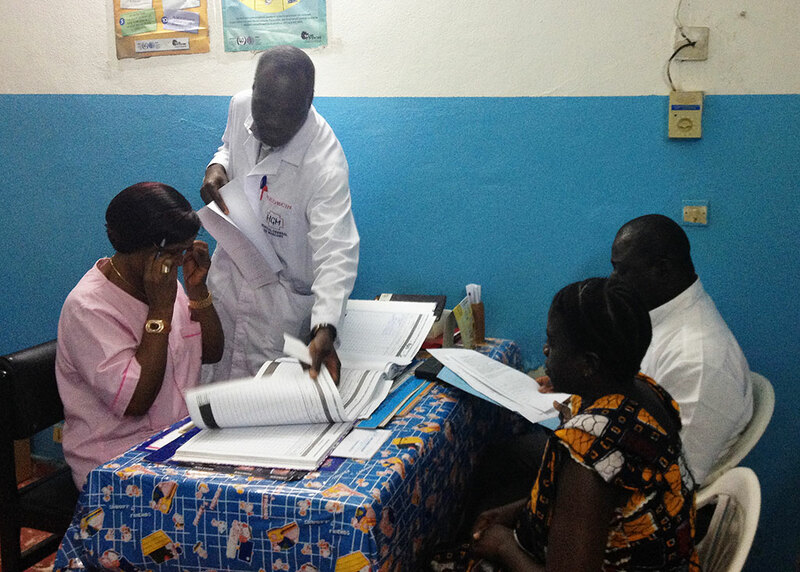 At Marcory Hospital, Tuesdays and Thursdays are cervical cancer screening days. Between March 2012 and September 2014, a total of 1,060 women, including 367 who are HIV-positive, were screened here. On this March day, the women listen carefully to the information that is being presented to them. When Dr. Martin is finished, each woman will go next door to the screening room to be checked. Irene first came to Marcory Hospital last year after being referred from another center because it was unable to provide her with antiretroviral therapy. When asked how she feels about being screened, she replies, “I am happy because I already have HIV, and it gives me peace of mind to know I don’t have cervical cancer.” Her parents and especially her husband, who is also HIV-positive, are very supportive of her being tested and encourage her to go every year. Screening for HIV-positive women is free. If a woman is found to have a precancerous lesion, she will also receive free cryotherapy treatment, thanks to UTAP II. Women who are not HIV-positive can still be screened for a small fee. To maximize their impact, the UTAP II-supported health care providers also visit health centers that have not received cervical cancer prevention equipment or training so they can provide this lifesaving service to women in those communities.